The popularity of social networking sites and apps has rapidly increased over the past couple of years. Social media can help you to earn trust and build a strong and loyal community around your website. It is a major source for traffic, website promotion, content consumption and user engagement. The benefits of social media is huge and you shouldn’t ignore it. While there are a lot of various social media plugins available in WordPress directory, high quality and functional ones are really difficult to single out. I’ve chosen several WordPress social media tools to share with you, which are fairly easy to use and stand out with their quality, features and functionality. Inherently, images are better at engaging the readers and are easier to consume. As the most popular photo sharing platform, Instagram has a super advantage over other social networks. Instagram Feed WD plugin is probably the most feature-rich, functional and advanced Instagram feed plugin I’ve used so far. It provides unique and fully customizable layouts to display the hashtag and user-based feeds and also features a powerful lightbox. You can show the feed images and other media as a slideshow using 15 different slide effects and also enable image comments, likes, captions, hashtags and other available info. The plugin uses two fully customizable themes, but if you want to use your own personalized themes, you are free to make new ones. Instagram Feed WD plugin offers advanced feed filtering options, which allow users to display photos based on their specified condition types, such as hashtags, captions, mentions, username and Instagram media link. If you are looking for a feature-packed and multifunctional social sharing plugin, look no further than Monarch. It allows you to show social sharing and following buttons in different locations triggered by various factors such as timed delay, after commenting or purchasing, after inactivity or when your readers reach the bottom of the post. It also allows you to display customized fly-ins and pop-ups when your visitors are most engaged, which ensures high number of content shares across over 20 social networks. The design of social share and social following icons is fully customizable and you can make them look exactly as you like. The analytics feature of the plugin is a great solution in order to help site admins to keep the track of shared content and see how many times particular content had been shared over various social networks. The plugin is responsive, fast and super advanced. 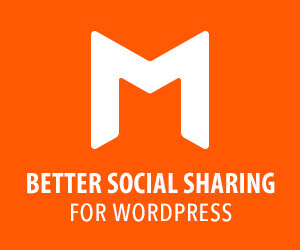 AddToAny social sharing plugin is among the most popular plugins in WordPress.org. Popularity range of this plugin is really high. It is rather justified by its wide list of options, modern UI and other cool features. It allows you to place share buttons in different locations, in the form of a floating bar or a widget and share your content on over 100 social networks. The plugin features a Google analytics integration for tracking the sharing of your content. AddToAny’s design is mobile optimized ensuring that your visitors will be able to share your content from all sized devices. The plugin is fully customizable to fit your every need. It is best known for its universal sharing button, which displays the network icons as you hover over it. This WordPress social plugin adds share buttons to all of your posts and pages in an easy and simple way. The plugin is responsive and adapts perfectly to any kind of device. You can customize the icons design and style, and choose the colors using its advanced color picker functionality. You can easily insert or hide the social icons in any of your posts using the given shortcodes. Simple Share Buttons Adder stands out with its tag integration feature, which actually displays tags, captions and descriptions of shared content. Effective social media integrations can help you to increase your traffic, improve overall functionality all over social networks and bring success on all platforms. If you are not using any of these great plugins on your website, give a try as most of them come for free. Don’t waste your time, just use them and see the amazing results you can achieve with these guys. Feel free to suggest other plugins that you think are worth mentioning. I’d be glad to hear from you. Gayane Mar is a passionate web-blogger who started her blogging activity a few years ago. Her posts are all about web design and web development. She writes all these posts for good people who need some guidance or advice with web development. The driving force behind her writings is the great hope that her blog posts would be helpful for each and every one reading them. If you are interested you can follow her own blog wpcapitan.com. Nextscripts plugin. Great way to syndicate your posts to different social media platforms. I made it a standard with all my sites. Thanks for the suggestion, Dan. Nice overview of the best Social Media plugins for 2016, thanks for that. I found some new useful tools like AddToAny, to optimize my blog with sharing buttons. You also list several tools for social media sharing, but have you heard of Blog2Social? I would strongly recommend it, because it really makes my blogging life much easier. I’m using it, because you can schedule and customize your posts individually for each network and then send them automatically to all of your networks in one easy step. That’s helpful to save valuable time. Thanks for suggesting Blog2Social, Max and thanks for stopping by. Hi, great Article, but Is there any plugin that adds Photos to Instagram Account. I am in process of creating website for my interior designing works. I need to have my gallery to be posted on the instagram. Not to import from Instagram, but to export it to Instagram. As my images will be watermarked index/serial numbers so, I can refer to the design based on the users queries from website or instagram. Please guide me, so we can I a functional business marketing. I believe Instagram doesn’t allow that, their API is quite limited.